Your entire employee risk management and communication platform in one place. As an employer, you should know where your employees are at any point in time. You must also know how to find them and communicate with them, should the need arise. Concur Messaging integrates independent, real-time risk assessments with employee location and travel itinerary data, giving you a single view into every employee’s whereabouts — and in a simple system for tailored one-way and two-way communication. Locate your team anywhere, anytime. Employees’ itineraries can be merged with data feeds from the global distribution system (GDS) and travel management company (TMC), and combined with your human resources information. 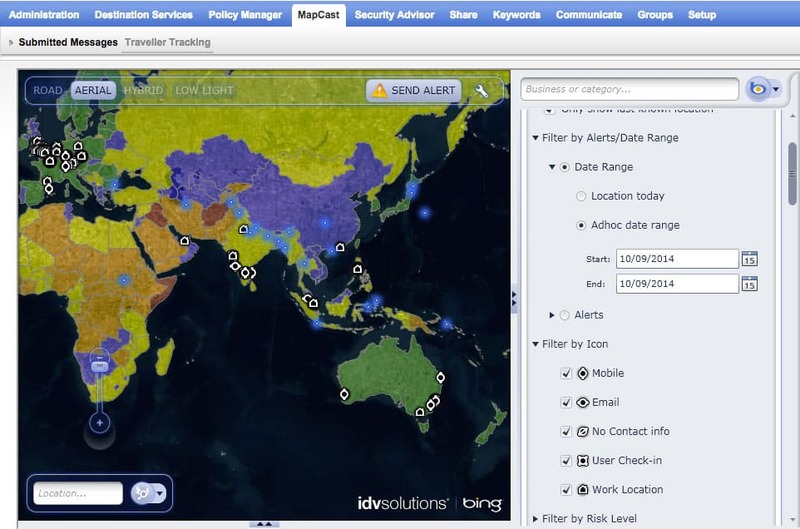 Employers can receive real-time updates of employees’ precise locations. 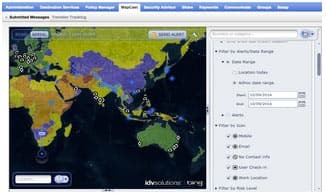 Managers can locate employees with interactive maps; filter by geography or risk; initiate 2-way communication. All team members can stay informed of world events around the clock with automated impact analysis matched to employees’ current locations. Employees and managers get pre-trip alerts, risk-level information and destination intelligence. Automated intelligent workflows can be defined based on determined risk-level assessments. Use phone, email and text to reach business travelers and confirm that messages are received. Count on multiple gateways to deliver/receive traveler communication for any country they’re in. Track communication with a single, simple, color-coded map. Easily share data and support your business travelers. Work with any assistance partner of your choice, so your employees are always covered. Get non-biased risk information every day from Riskline, our exclusive, global travel-risk partner. Share itinerary data with any travel partner, creating a virtually impenetrable support network. Maintain your risk management infrastructure with built-in flexibility, even if you change TMCs.